Fullerton College Students and Parents: Did you get every course you wanted/needed when registering for classes this Spring? Shouldn’t a 2-year community college do everything they can to promote speedy graduation and transfer to CSU, UC or another 4-year college? Why is it taking the average Fullerton College student 3+ years to graduate from a 2-year institution? In order to survive, the administrators at Fullerton College and the North Orange County Community College District ($191,000,000 annual budget) must squeeze more and more money from the state, county, and every one of its students, faculty and staff. There’s even $6 million in surplus bookstore profits to prove it. Now the college wants to spend all that money on themselves and a stadium that will benefit an elite few (wealthy outside groups), not the entire student body. You the students and community are the most important assets the school has. Without you, there is no Fullerton College. It’s that simple. Converted for Fullerton College home football games. 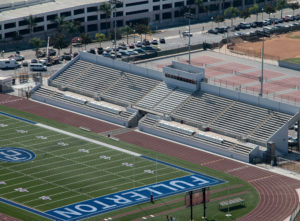 The District Stadium at FUHS sits just one block west of the college campus. Artist rendering of the $6M lighted stadium at Fullerton College. We don’t oppose modest field improvements. We do oppose an unnecessarily large rental stadium that will be rented to wealthy private schools and outside sports groups. CALL and/or EMAIL everyone on this list today (1st month of school is best) and demand excess college and bookstore profits be spent on more course offerings, lower textbook prices and more benefits and pay for overworked faculty and staff. The entire community, school and student body will benefit. Some history and where we are today: Fullerton College now wants to build a 4,417 seat stadium at Hal Sherbeck Field for outside rentals, 6-home football games, competitive athletics, academic instruction and outside rentals. 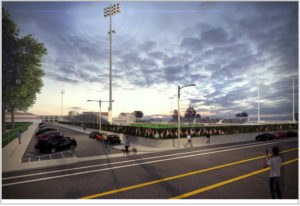 Built in 2010 using measure X taxpayer bond monies, the 8 year-old Sherbeck Field Improvements are to include 6 lighting towers, a 12 speaker array P.A. system, a press box and field to be lighted until 10:30 p.m. on Saturday evenings. FUHS District Stadium (converted) with Fullerton College’s 1,200 space North Lemon parking structure in background. • Fullerton District Stadium- (cap. 6,700) at FUHS. The $10.1 Million newly renovated (2017) state-of-the-art professionally lighted football stadium is literally across the street from the college’s campus, and the field can easily be converted/re-striped with narrower hash marks, and colored blue and white to give Fullerton College a true home field look. • Titan Stadium (at CSUF)– (cap. 10,000) an underutilized college field built for a football program that no longer exists using taxpayer money in the form of Fullerton redevelopment funds. Fullerton taxpayers have already paid for a community sports stadium. Why can’t CSUF be made to work together with Fullerton College on a reasonable shared use agreement for that field’s use? Would either option not better serve the entire community of Fullerton? 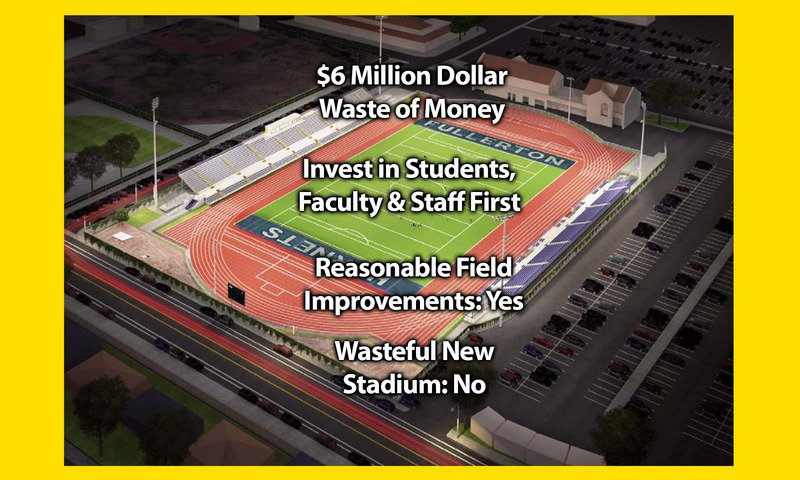 For unknown reasons, Fullerton College can’t or won’t reach a shared use agreement for the Fullerton District Stadium- an agreement (according to current NOCCCD board member Jeff Brown) that has eluded several previous Fullerton College administrations. 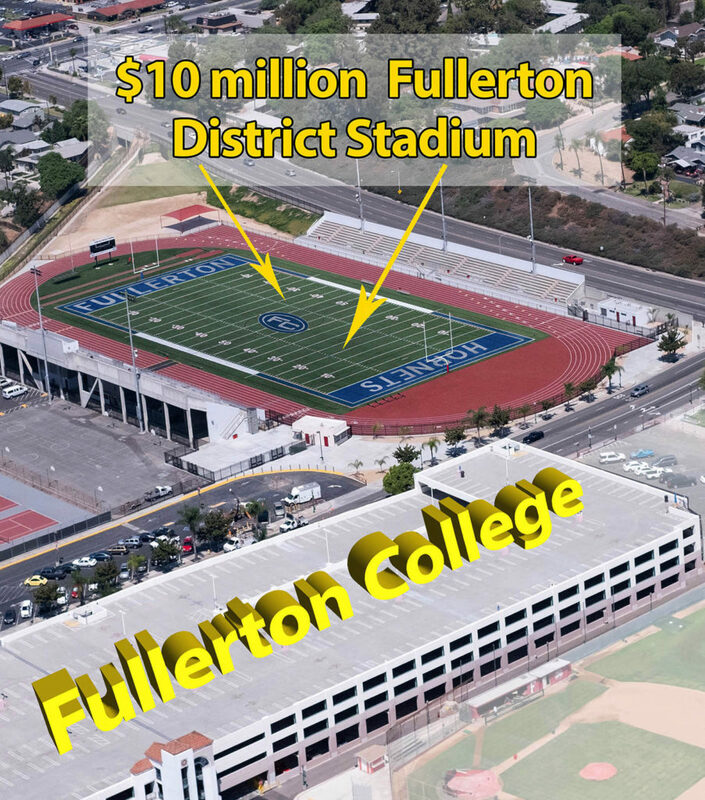 Perhaps Fullerton College president Greg Schulz and his trusted staff will choose to finally work together with the FJUHSD’s board to play their home football games at Fullerton District Stadium (repainted blue and white) for college home games. FCNAC (Fullerton College Neighborhood Action Council) is a 500+ strong (and growing) group of angry and concerned neighbors & homeowners and we are legitimately Fed-Up with Fullerton College. Fed up with their outright lies, non-transparency, administrative bloat and disregard for their neighbors. Stay up to date on the latest news by Contacting us today for our newsletter here. Sign our online petition here– Let your voice be heard NOW before it’s too late.